Ladies and gents, Father’s Day is nearly upon us. And you know what that means? No, let’s hope it doesn’t mean another Father’s Day necktie or coffee mug for you dads out there. Rather, let’s skip the necktie shelf and head straight for the bourbon shelf. Hello, Father’s Day cocktails. As part of my home bar series, I recently extolled the virtues of Elijah Craig Small Batch, which has long been one of my go-to bourbons. And it’s for good reason. Elijah Craig Small Batch is a classic bourbon, flavorful and with a long finish, yet plays well in classic bourbon cocktail recipes. 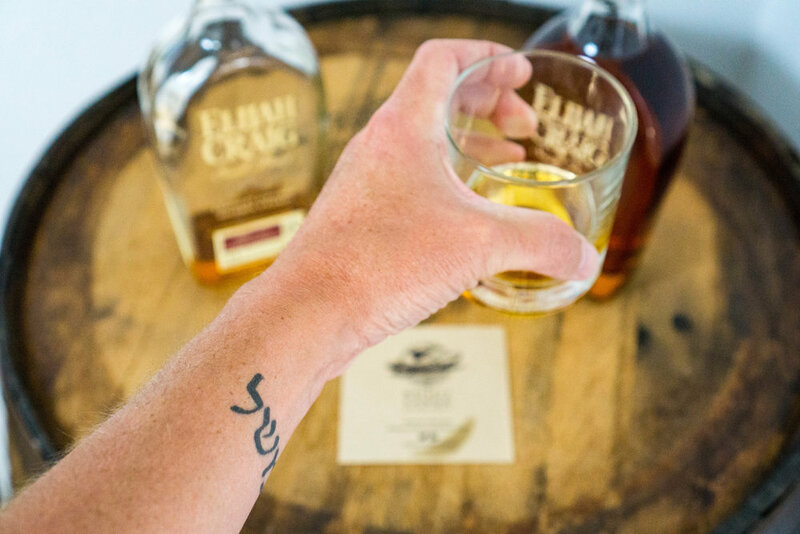 As such, I couldn’t be more stoked to be partnering with Elijah Craig this month in celebrating good taste for Father’s Day. Because bourbon, and bourbon cocktails, two of my favorite things. It seems especially fitting talking Elijah Craig bourbon and cocktails for Father’s Day, since Elijah Craig himself has been referred to as the “Father of Bourbon,” often credited as the first to mature whiskey in charred oak casks. However, there are a number of different stories about how that came to be. This was more than 200 years ago after all. One of the most common accounts tells a story of a fire in Elijah Craig’s mill that charred the barrels, in turn changing the character of the whiskey inside. But whatever the case may be, I think we can all agree that we're thankful for what bourbon has become today. So with it being Father's Day weekend, today we celebrate good taste, good bourbon, and fathers. Below, find three Elijah Craig bourbon cocktails to supplement that bottle of Elijah Craig Small Batch. The Old Fashioned is the OG whiskey cocktail, which is fitting, since we’re talking about the OG bourbon maker, Elijah Craig. According to cocktail historians, and most references, the drink that we now know as the Old Fashioned, likely originated in the early 1800s. But while at its core, the Old Fashioned is just three ingredients, it takes many forms, depending on the bar and bartender. Many add club soda, others use simple syrup (over the traditional granulated sugar or sugar cube), and still others muddle fruit in preparing it. I’d like to think of myself as more of a purist, however. My take on the Old Fashioned cocktail recipe begins with adding a ½ teaspoon of sugar (or 1 sugar cube) to a mixing glass and wetting the sugar with a couple dashes of bitters and a small splash of club soda (only enough to wet down the bitters), and muddling it into a paste. I follow that with a couple pieces of ice and one ounce of bourbon, and stir for approximately 10-15 seconds. I then add more ice and the rest of the bourbon and continue to stir. Lastly, I strain it into an Old Fashioned glass over a big ice cube or sphere and add a flamed orange peel for garnish (Click here for instructions on flaming an orange peel). It’s only fitting that smoked cocktails would be among my favorite cocktails. Couple my love for bourbon with my North Carolina smoked barbecue roots, and it’s a match for heaven. This second Elijah Craig cocktail recipe takes my love for bourbon and roots in the south, and applies it to the classic Manhattan cocktail. The difference from the classic recipe being that I cut the vermouth in half and add a half-ounce of maple syrup, and then smoke the cocktail. If you don’t have a smoking gun, than a crème brûlée torch or other handheld torch will do. To make it, you’ll first smoke a glass. You can do this a couple of different ways. You can light a wood plank, or wood chips, and then trap the smoke under the glass for a couple minutes so that the smoke clings to the glass. Or, in my case, use a smoking gun and glass dome and smoke the entire cocktail. For the actual cocktail itself, you’ll add all of the ingredients to a mixing glass with ice and stir. Strain into a coupe glass and garnish with a cherry. Voila! This is what I like to call the drink of Whiskey Tango Globetrot. Bourbon, peaches, mint; could it be any more southern? It’s my riff on a smash, which is another OG cocktail, dating back to the 1800s. It’s in the family of juleps, which is considered one of the first American cocktails. Jerry Thomas, considered the “father of mixology,” declared, “This beverage is simply a julep on a small plan.” The name speaks for itself, as it’s essentially a smash-up of fresh fruit and herbs. It's the garden cocktail. This version smashes a couple of my favorite fresh ingredients, mint and peaches. But I first make a peach-infused simple syrup. To do this, you take the typical simple syrup recipe (equal parts water and sugar to a boil), and then bring it to a boil with slices from a couple peaches. Crush the peaches with a muddler once it’s come to a boil to release its juice, and then remove from heat and steep for 30 minutes before removing the peaches. For a real treat, sprinkle the cooked peaches with brown sugar and cinnamon. Once you’ve got your cooled simple syrup, you’re ready to make the drink. You’ll first muddle a couple fresh peach slices, lemon wedges and mint in a cocktail shaker. Add the bourbon and peach simple syrup with ice and then shake and double strain into a rocks glass filled with ice. Garnish with mint sprigs and a peach slice. This is a sponsored conversation written by me on behalf of Elijah Craig. The opinions and text are all mine.